He accompanied and cooked for a paramilitary group allied with the Taliban, known as the 55th Arab Brigade, which the Court says included Al Qaeda members. After the U.S. entered the war in Afghanistan, the group was forced to retreat and surrendered to the Northern Alliance. The Northern Alliance held him until 2002 then turned him over to U.S. forces who sent him to Guantanamo. While the focus on Guantanamo this week has been on the 10 who will be charged in federal court or military commission trials, the AP today has a report on the 15 Judges of the U.S. District Court for the District of Columbia who have been holding habeas hearings for the Guantanamo detainees not charged with crimes. The hearings have been ongoing as a result of the Supreme Court's decision that detainees have the right to challenge their detention and conditions of confinement. So far, 30 have been ordered released, and 8 have been ordered detained. The scorecard is here. When a person facing execution has strong evidence of his innocence, he should have ample opportunity to bring those claims back into a court of law. The law as it stands today is flawed in this respect. Rep. Johnson's bill would ensure that death row inmates have the opportunity to present newly discovered evidence of innocence. Given that 139 people have been wrongfully convicted and sent to death row in the last three decades in the United States, it is especially important that lawmakers take a close look at the flaws in a system that irreversibly takes human life. The Congressional Research Service has released a new report, Enemy Combatant Detainees: Habeas Corpus Challenges in Federal Court (pdf). 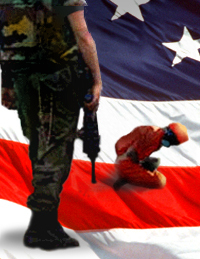 This report provides an overview of the CSRT procedures, summarizes court cases related to the detentions and the use of military commissions, and summarizes the Detainee Treatment Act, as amended by the Military Commissions Act of 2006, analyzing its effects on detainee-related litigation in federal court. The report summarizes pending legislation and provides an analysis of relevant constitutional issues that may have some bearing on Congress’s options with respect to the Guantanamo detainees. Update: C-Span 3 is stream and playing the audio of the hearing now (11:44 am ET). The AP now has a report, Justices Grill Detainees' Lawyer, on how the arguments went. The Supreme Court today is hearing oral arguments in the consolidated cases of Boumediene v. Bush and Al Odah v. U.S., 06-1196 regarding the rights of Guantanamo detainees to challenge the legality of their confinement in federal courts. Lawyers for the foreign detainees contend the courts must step in to rein in the White House and Congress, which changed the law to keep the detainee cases out of U.S. courts after earlier Supreme Court rulings. The most recent legislation, last year's Military Commissions Act, strips federal courts of their ability to hear detainee cases. Solicitor General Paul Clement, representing the administration, said foreigners captured and held outside the United States "have no constitutional rights to petition our courts for a writ of habeas corpus," a judicial determination of the legality of detention. I'll believe it if it happens, but according to the New York Times, Bush administration officials are discussing providing more legal rights to the Guantanamo detainees it seeks to hold as enemy combatants. The discussions are described as a step on the road to closing Gitmo. Why the change of heart? The Administration may be fearful the next case the Supreme Court decides will be too generous to the detainees. The administration has fought for years in court and in Congress against granting the detainees more rights. In the latest instance, the Supreme Court is to consider a case brought by Guantánamo detainees who are seeking to challenge their confinement in habeas corpus suits in federal court. If the administration loses that case, it could give the detainees even more legal rights and create a precedent limiting the president’s and the military’s power. Lawyers inside and outside of government said a detailed proposal from the administration to give detainees fuller legal protections could convince the justices that they need not resolve the case, Boumediene v. Bush. The Center for Constitutional Rights has filed what it says is a "groundbreaking brief" (available here) on behalf of Guantanamo detainees. On August 24, 2007, Center for Constitutional Rights (CCR) attorneys and co-counsel submitted a ground-breaking brief to the Supreme Court in the case that will determine whether detainees at Guantánamo possess the fundamental constitutional rights to due process and habeas corpus. The brief was filed on behalf of men from the first habeas corpus petitions submitted immediately after the landmark 2004 Supreme Court decision in CCR's case Rasul v. Bush. Al Odah v. United States, as the case is now called, has been consolidated with a related case, Boumediene v. Bush; both challenge the Military Commissions Act (MCA), which attempted to strip away the statutory right to habeas corpus the Supreme Court recognized in 2004 and replace it with a far more limited review process set up by the Detainee Treatment Act (DTA).